Earlier this week, our online store began carrying napkins from Graymarket Design! 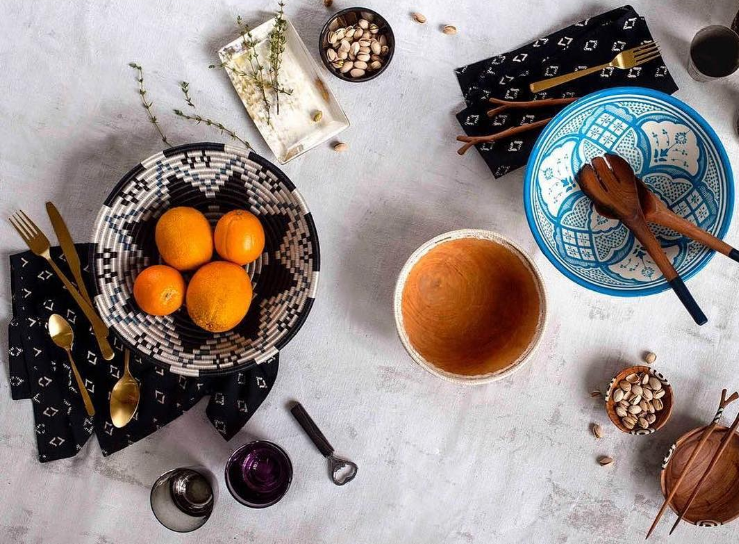 We love all of their products, especially their tabletop textiles, and founder Hallie Gray is a personal woman-entrepreneur hero of ours (seriously this lady is a BOSS!). We sat down with her to pick her brain about her brand, her craft, and what it's like to work with a team of artisans overseas. Graymarket Design is a textile company rooted in modern design, with casual but high-quality products and ethical production. They collaborate with a team of artisans in Jaipur, India, to have their original, hand-drawn designs printed in small batches. Hallie Gray started Graymarket in 2013 after studying textile design and becoming fascinated with the hand-crafted textiles she encountered on her travels throughout India. She is inspired by a minimal aesthetic, rich color stories grounded in neutrals, and the beautiful imperfections inherent in hand-crafted textile traditions. Oh, and she has two small furry business partners- Henry and June. Love it. How did you start and where did Graymarket come from? So, I got my undergrad in international relations, and through that process, did a lot of traveling, ended up going to India. I discovered these markets with these amazing textiles and was really drawn to them. After undergrad, and after working in the "normal" business world for a couple years, I was asking myself, what do I see myself doing long-term? And it was clearly something more creative and design-oriented. And so then I went to textile design school, and at the end of that, found myself gravitating more toward the hand-printed aesthetic versus screen printing. A lot of people were doing a lot more machine-based stuff. I just remembered those moments, those walks in the markets, and ended up putting out my feelers, doing some workshops, and just thinking well, I'll just see what happens and have them print some of my designs. And it just kind of went from there. Where do you get inspiration for your different seasons and different designs? I'm a shipping facility, logistics, marketing, and accounting, and I've had to be good about setting aside those days for designing. What really inspires me is the technique, the textural designs, printed in this way, in certain colors that I like. Depending on the season and what their weather is doing [in Jaipur], I try to work around that. I'll try to make all the designs go together, say for napkins, I want to be able to mix and match, and they can all sit together on a tabletop. How far out do you begin planning for your next season? I really try to plan a couple months before. The sampling process takes about a month, so I give myself a little buffer. For your colors, do you just use what you are attracted to or do you try to predict trends? I'll experiment with colors, but once everything's done, I put all the designs next to each other, and if one is just clearly random, I'll take it out. I always try to balance different, trendy colors with gray, and that's how I make it more accessible to myself [laughs]. You just did your new bedding line, which is really exciting! What else do you see down the line for your business? I got some mud-cloth on a trip to Africa, and it was so easy for me to just hang up. So I was thinking about making an interesting pattern, and I've designed some in black and white. It would just come with a dowel and string, a foot and a half by a foot and a half, rolled in a scroll and would just be really affordable. I thought it would be a really easy way to decorate, like for a dorm or an apartment, without having to get something framed. I think it will be cool. There's this technique in India called appliqué, and it's... hard to explain, but you dye the background and then you have a different color, where things are sewn into a shape and stitched onto this background color. Of course in India, it's very ornate and beautiful, but I'm playing with it in a very geometric way, with shapes. Oh, and in my workshop, we have all this extra material and it just sits around, so we had the idea to use the fabric to make journals and things, make like a low-end office and organizational line. It creates jobs for a different segment of people, who work in that craft. Are you working with the same family there (in Jaipur, India) that you've been with the whole time? There's this one guy, he's sort of the ring leader, and he coordinates between all these families and artisans. He primarily runs the block printers, block carvers, and the sewers. He would outsource like, the stitching of the journals, or the appliqué, or that kind of thing. I know that you've had some challenges with the distance between yourself and your team, do you feel like you have a good working relationship? Oh, yes. They are my business partners. We talk over Skype, his name is Sheril, and his English has gotten a lot better. He told me when I first went to visit in India a few years ago, he couldn't understand anything I was saying. I'm like, we just had a great meeting! And he's like, I don't even know what she said. He is a very low-stress person, which you have to be with that job, because he wrangles 100 things at a time. I'll be freaking out, and he's always just like, it's okay Hallie, it's all going to work out. It's a funny relationship because I want to show respect and appreciation for everything that's happening, but I have to be strict about there not being any mistakes in an order. We give each other motivational pep talks though, it's really nice. He is a gem. It wouldn't work with anyone else. Is there anything you're looking forward to in the next year? We're ramping up our trade show circuit, so we're going to include the Vegas market now. We're also just trying to work on our digital marketing and our website. Trying to maybe hire another person, so I can focus more on design. Socially conscious brands, like Fashionable. They have beautiful stuff, and they are an example of people who have a great process and product and really give back. Raven + Lily is another good one. Anyone at Renegades, I'm inspired by anyone out there trying to do this. You're exhausted and broke? yes. Thanks to Hallie and Graymarket Design, for all the great items they produce! Check out the video below to learn more about their process and their team in Jaipur, India.